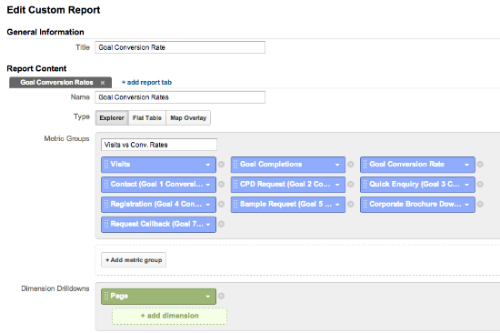 The conversion report in Google Analytics is probably the most important report in the entire service. The conversion report shows you the percentage and absolute numbers of visits which converted into a set of defined goals for a website. Goals can be any marketing outcome related to lead generation and sales from enquiries through to video views. This particular website converted 3.65% of traffic (conversion rate) into performing some sort of action which I have determined as a goal for the website. A total of 147 goals (absolute number) were completed in this particular month and this is one of many metrics used to measure the performance of the website month on month or quarter by quarter. What about the conversion rate for just the enquiries? 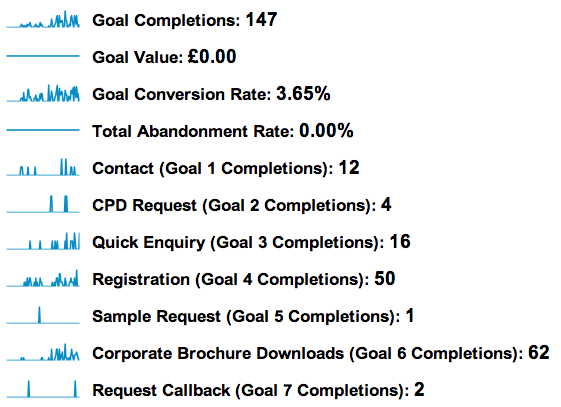 The issue that I have with the above conversion report is that it’s difficult to view the conversion rates for each of the goals, especially the lead generating goals. Whilst it’s good to focus on absolute numbers, it’s also interesting to see the conversion rates for each specific goal. You can then refine marketing initiatives to improve each goal or a set of goals for example. Enter the wonderful facility of custom reports. Note: Select ‘Page’ as a dimension as you can’t save a custom report without selecting a dimension. You can ignore this data in the report if you wish. Voila! Now you can see the conversion rate by goal. To get a conversion rate for your lead generating goals all you do is add the conversion rates together. So in this case it’s 2.11% (goal 1 + goal 2 + goal 3 + goal 4 + goal 5 + goal 7). The website converts 2.11% of traffic into sales leads. When reporting, it might be useful to report both conversion rates and absolute numbers purely because traffic generating tactics will skew numbers for any particular month. A classic example of this is when social media activity is increased. Great as a traffic driver, probably not so for conversions thus resulting in lower conversion rates for that month. Pritesh is the Digital Marketing Manager for Pauley Creative, a specialist digital marketing agency for the construction industry. Pritesh is responsible for developing and implementing online marketing strategies and measuring the performance of client websites and campaigns to enhance lead generation and brand awareness. Majority of the time Pritesh is blogging about all things Analytics and SEO on the Pauley Creative blog. His experience includes working client side and agency side in the B2B environment. You can follow Pritesh on Twitter and connect on LinkedIn. Need help with your Google Analytics? Google Analytics vs Universal Analytics? Don’t fall foul of these common Google Analytics mistakes Google Analytics is a fantastically useful tool for businesses of all sizes. Rather helpfully for all the SMEs and SMBs out there, it’s also free. That means anyone can start using ….. Learn several analytical data sources you should tap into within your lead-generation, e-commerce and other online contexts, and how to quickly synthesize and share the insights As a digital marketer, you clearly need customer insights to drive your tactics and ….. Build your own CrUX dashboard on Google Data Studio to see visual stats on origin performance After the latest announcement of changes to Google Ads, the introduction of responsive ads, better video and YouTube advertising, cross-device reporting functionality, and the …..